Enter a team in the Ipswich Hospital Foundation Park2Park and experience the training, challenge and the health benefits, TOGETHER! Team registrations will be taken until 5pm Monday 15th July 2019. No changes or additions to teams can be made after this time. Social Teams Challenge for workplaces, clubs, community organisations, friends and other teams. Fitness Team Challenge includes gyms, personal trainers, fitness groups and Crossfit. 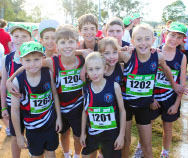 School Shield teams challenge is for schools to compete against other schools. 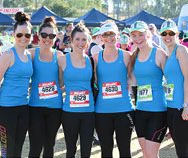 Qrun Clubs are encouraged to enter the Qrun Clubs challenge. This challenge is based on participation, the club with the most finishers will win $500.00 for the club and a club shield. What is included in the Team Village? Teams in the Team Village will be provided with a marquee/s, an eski/s containing cold water and a light snack to enjoy provided by Figjam Express. Teams will also have close access to food and beverage outlets and communal tables and chairs all within the exclusive Team Village area. What additional items can I bring in for my team in the Team Village? Team Village members can bring additional chairs, tables, snacks etc for your team to enjoy. Teams are welcome to display team/business signage, promotional items, decorations etc however this all must be contained in your allocated marquee/s. What items are not permitted in the Team Village? Personal BBQ’s, sound systems and selling of any kind is not permitted in the Team Village. Ipswich Hospital Foundation has a no helium balloon policy at outdoor events. Any teams found to have helium balloons will be asked to dispose of them immediately. How will I know if my team has qualified for the Team Village? Team Managers will be notified by email if their team is one of the first 25 teams to reach 15 members or more. Minimum number of team members Teams must consist of a minimum of 4 participants. There is no maximum number of team participants. 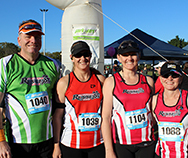 Prizes Teams can participate in any Ipswich Hospital Foundation Park2Park events (Half marathon, 10KM, 5KM Run, 5KM Walk & 2.5KM event) but team prizes will only be awarded on the basis of the first four team members in each event distance (5KM Walk and 2.5KM event not included). 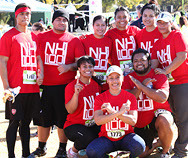 This means there will be a Half Marathon winning team, 10KM winning team and 5KM Run winning team. Winning teams will get the glory & bragging rights of winning for 12 months & their team name engraved on the perpetual trophy plus a team winning shield. All team entries must be submitted online only. Each team must nominate a team manager who is over the age of 18 years. This person may complete entry details for all team members on the team entry page or provide team members with the team name and password to complete their own entry details. Where the team manager is completing the entry process on behalf of team members, the team leader must only provide the details of team members who have consented to being team members and having their details supplied on their behalf by the team manager. Where a team member is under 18 years of age the Team manager must have the consent of that team member’s parent or guardian to supply their details. Required entry details for all team members includes full name, address, telephone number, date of birth, emergency contact details and email address. Team members without an email address will not be able to enter. The address can be different for each team member, or the same address can be provided for all team members. Team managers do not need to register to participate. Please note, NO additional team members can be added to your team after 5:00pm on Monday 15th July 2019. Race Kits Team managers can choose if they would like their race kits bundled as a team or individual. If a team bundle is chosen race kits will not be able to be collected individually. Sunday 28th July 2019 from 5:45am until 30 minutes prior to the start of your event: Bill Paterson Oval, Limestone Park.